Rather than kick their feet up this Memorial Day weekend, the astronauts aboard the International Space Station will be unloading cargo from the first private spacecraft ever to visit the orbiting lab. 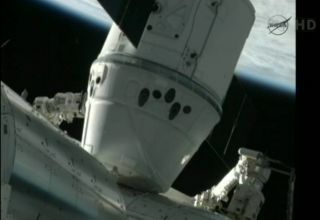 SpaceX's unmanned Dragon capsule docked with the station Friday (May 25), making spaceflight history in the process. Another milestone came Saturday at about 5:53 a.m. EDT (0953 GMT), when the hatches between Dragon and the $100 billion orbiting lab were opened. The station's crew is now able to access the 1,014 pounds (460 kilograms) of cargo that the Dragon spacecraft brought up. But unpacking the capsule in earnest won't begin until Memorial Day (Monday, May 28), NASA officials said. Six spaceflyers are currently living aboard the station: NASA astronauts Don Pettit and Joe Acaba, European astronaut Andre Kuipers, and Russian cosmonauts Oleg Kononenko, Gennady Padalka and Sergei Revin. Pettit, Acaba and Kuipers will handle most of the unloading operations, which should take a total of about 25 hours, Ridings said. Dragon's cargo consists primarily of food and clothing for the station astronauts, as well as 15 student science experiments. "There's about as much stuff in here as I can put in the back of my pickup truck and don't think there will be any issue with the three of us working and getting this thing unloaded over the next two or three days," Pettit told reporters Saturday. SpaceX holds a $1.6 billion contract with NASA to make 12 supply runs to the space station. Dragon's current mission is a demonstration flight to see if the capsule and SpaceX's Falcon 9 rocket are ready to start the bona fide cargo deliveries. If all goes well, the first of the 12 contracted missions could launch in September, NASA officials said. Dragon is slated to stay docked to the orbiting lab until Thursday (May 31), when it will detach and return to Earth with about 1,400 pounds (635 kg) of used gear from the station. The capsule is scheduled to depart and splash down in the Pacific Ocean off the California coast, where SpaceX personnel plan to retrieve it with a recovery ship. The six station astronauts have been busy for a while preparing for Dragon's arrival, but they'll get a chance to relax for at least part of the holiday weekend, Ridings said. "We are going to give our crew some time off," Ridings said. "They've been working very hard over the last couple of days, so they'll have a little bit of time off over the weekend."